1 JOB DESCRIPTION MICHIGAN CIVIL SERVICE COMMISSION JOB SPECIFICATION OCCUPATIONAL SAFETY ADVIS Employees in this job complete and oversee a variety of professional assignments to review and evaluate occupational safety practices, procedures, programs, attitudes, and awareness in industrial, construction, office and other work environments; and to determine, develop, organize, and conduct training and other methods of safety improvement. There are five classifications in this job. 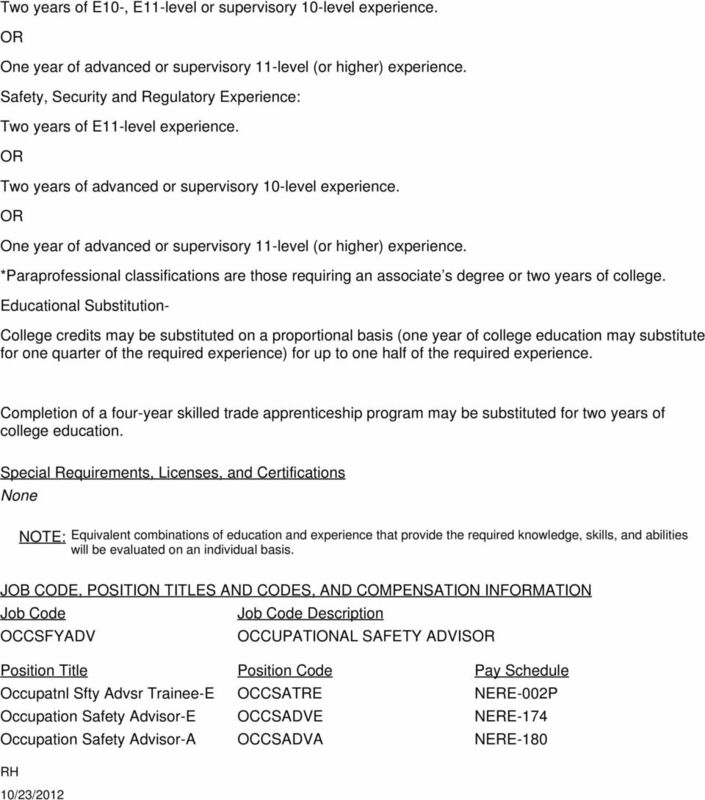 Position Code Title - Occupatnl Sfty Advsr Trainee-E Occupational Safety Advisor (Departmental Trainee) 9 This is the entry level and serves as a parallel classification to the Occupational Safety Advisor 9 for classified state employees who do not possess a degree. The work performed is identical to an entrylevel Occupational Safety Advisor 9; i.e., the employee carries out a range of professional occupational safety advisor assignments while learning the methods of the work. 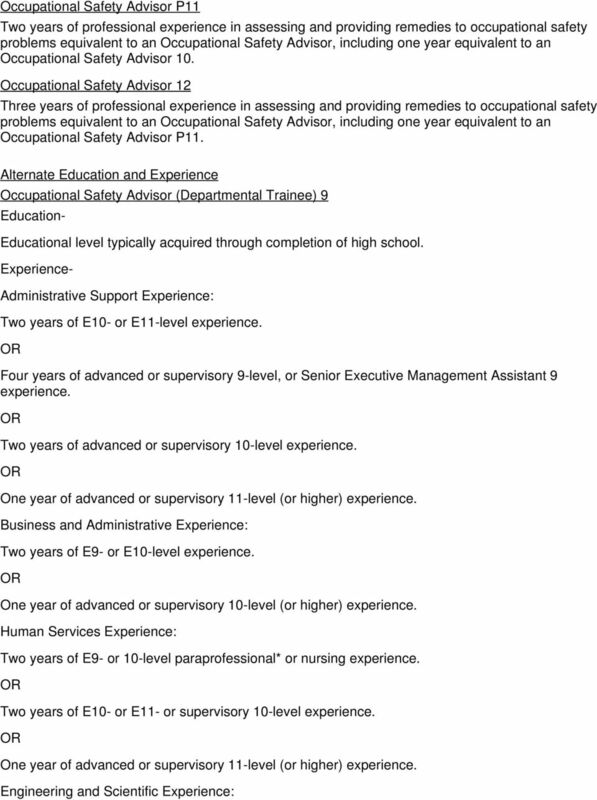 Position Code Title - Occupation Safety Advisor-E Occupational Safety Advisor 9 This is the entry level. The employee carries out a range of professional occupational safety advisor assignments while learning the methods of the work. Occupational Safety Advisor 10 This is the intermediate level. The employee performs an expanding range of professional occupational safety advisor assignments in a developing capacity. Occupational Safety Advisor P11 This is the experienced level. The employee performs a full range of professional occupational safety advisor assignments in a full-functioning capacity. Considerable independent judgement is used to make decisions in carrying out assignments that have significant impact on services or programs. Guidelines may be available, but require adaptation or interpretation to determine appropriate courses of action. 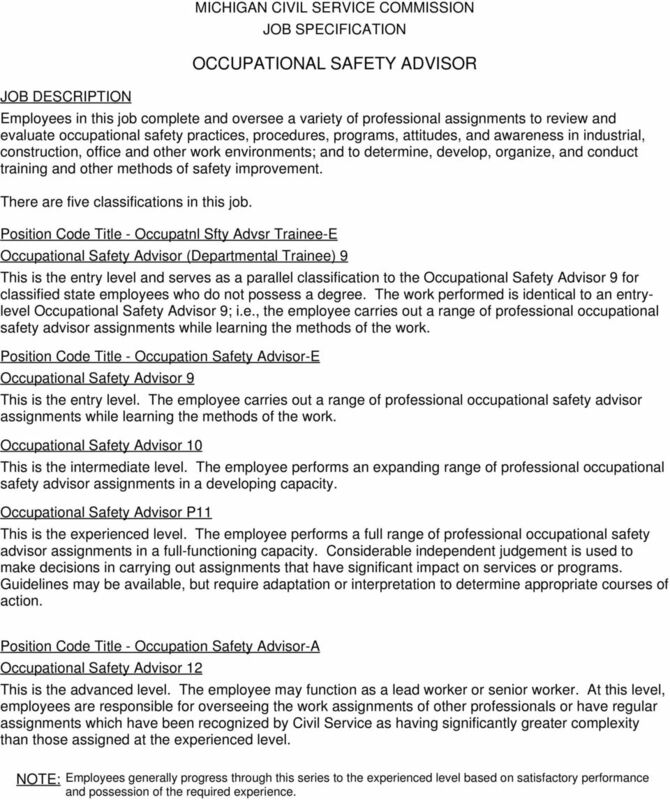 Position Code Title - Occupation Safety Advisor-A Occupational Safety Advisor 12 This is the advanced level. The employee may function as a lead worker or senior worker. At this level, employees are responsible for overseeing the work assignments of other professionals or have regular assignments which have been recognized by Civil Service as having significantly greater complexity than those assigned at the experienced level. NOTE: Employees generally progress through this series to the experienced level based on satisfactory performance and possession of the required experience. 2 JOB DUTIES NOTE: The job duties listed are typical examples of the work performed by positions in this job classification. Not all duties assigned to every position are included, nor is it expected that all positions will be assigned every duty. Evaluates existing safety programs and procedures to determine their relevance and thoroughness. Observes employees on the job to determine if work methods or techniques are as safe as possible. Contacts employers to explain available services and generally promote a safe work environment. Evaluates injury reports to identify possible correlation between accidents and such characteristics of jobs as their methodology, equipment or environment. Evaluates existing safety and health management systems, accident prevention programs, and hazard control procedures to determine their effectiveness. Advises employers with respect to evaluation of employee work practices, abatement of hazards, and methods to minimize or eliminate employee exposures. Communicates with employers to promote and explain available agency servcies and their value in creating a safe and healthful work environment; provides information regarding rights and responsibilities as defined under the Michigan Occupational Safety and Health Act(MIOSH Act). Writes reports for employers to identify gaps in their safety and health management systems, and recommends specific training, abatement advice, and system development options. Designs course instruction, develops training materials and conducts public seminars and workshops on a wide variety of occupational safety, compliance with safety standards, and safety and health system development. Conducts on-site customized safety training programs for employees/employers on the principles of accident prevention, accident investigation, and a wide variety of the other safety-related subjects. Conducts informal safety training and participates in in-service training programs related to revisions of the standards, enforcement, current issues and new technologies. Evaluates injury and illness reports to identify possible trends or correlation between accidents and such characteristics of jobs as their methodology, equipment or environment. Computes such injury statistics as incident rates, days away from work/restricted case rates, and calculates accident cost analysis. Works collaboratively with organizations and associations through education, consultation, and dialogue; creates strategic partnerships to improve awareness of worker safety to help reduce injuries orillnesses. Serves as a liaison with other outside agencies or organizations. Documents violations and hazards through notes, sketches, measurements, photographs, and/or videotapes. Prepares detailed citations and writes safety recommendations after analyzing safety hazards and concerns. Maintains records, and prepares reports and correspondence related to the work. Assesses and evaluates work operations, production methods, and equipment to determine potential hazards and violations of MIOSH Act standards and/or other industry standards. Collects samples and refers potential health hazards to an industrial hygienist. Investigates occupational accidents, fatalities, and injuries to identify contributing factors and determine violations of MIOSH Act standards. 3 Conducts meetings with employer and employee representatives to discuss such points as the standards, cited violations, and potential hazards and to resolve disputes regarding occupational safety and health issues. Credibly documents and testifies during administrative hearings. Writes safety proposals for employers, analyzing safety concerns and recommending training and program development options. Trains employers and employees in the principles of accident prevention and investigation. Develops and conducts seminars and workshops on occupational safety issues pertinent to a variety or number of employers within a region. Conducts safety training programs for employees/employers on specific job-related techniques, and rights under State and Federal occupational safety and health standards. Conduct Noise and Air Monitoring Surveys to evaluate work environment, and determine if additional programs or personal protection equipment is needed in the work place. Computes such injury statistics as workers' hours lost and cost to the employer, from data in employers' injury reports. Advises employers as to the form and content of record keeping for injury reporting. Maintains records, and prepares reports and correspondence related to the work. Performs related work as assigned. Additional Job Duties Occupational Safety Advisor 12 (Lead Worker) Oversees the work of professional staff by making and reviewing work assignments, establishing priorities, coordinating activities, and resolving related work problems. Occupational Safety Advisor 12 (Senior Worker) Performs on a regular basis professional occupational safety advisor assignments which are recognized by Civil Service as more complex than those assigned at the experienced level. JOB QUALIFICATIONS Knowledge, Skills, and Abilities NOTE: Some knowledge in the area listed is required at the entry level, developing knowledge is required at the intermediate level, considerable knowledge is required at the experienced level, and thorough knowledge is required at the advanced level. Knowledge of the types and kinds of generally accepted safe work practices. Knowledge of a variety of occupational environments, such as space and arrangement of equipment. 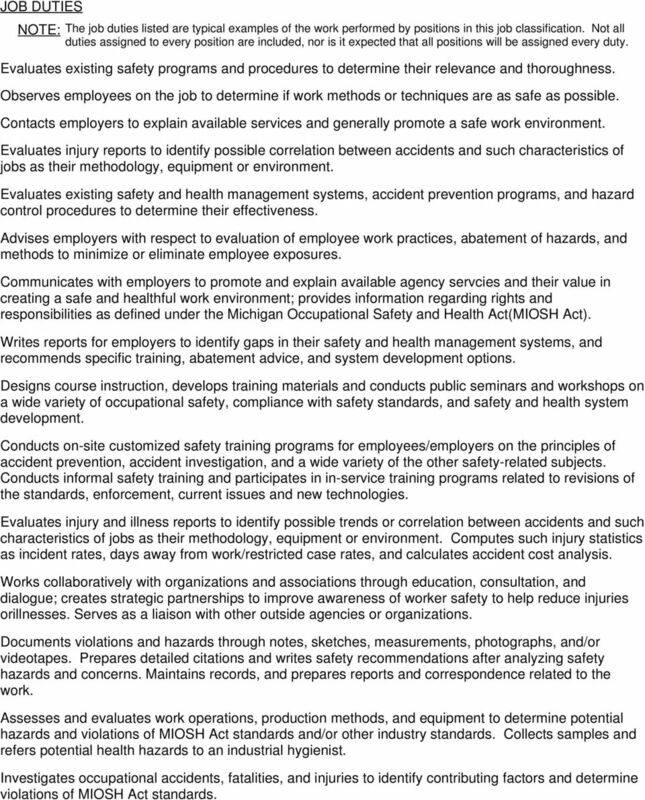 Knowledge of safety standards and regulations for the workplace. Knowledge of safety devices to use in conjunction with tools and equipment in the workplace. Knowledge of the properties, handling and storage of corrosives, contaminates and flammables. Knowledge of record keeping requirements for injury reporting. Knowledge of training and instructional methods and materials and their use. 4 Ability to determine alternate, safer ways of doing job tasks. Ability to plan, develop, and conduct training sessions, workshops, conferences, seminars and programs regarding safety issues and promotion. Ability to prepare and select training materials. Ability to identify work place practices that could lead to worker injuries. Ability to evaluate safety practices, procedures, programs, attitudes, and awareness and to recommend methods of improvement. Ability to summarize and report findings and recommendations. Ability to communicate effectively with others. Ability to maintain favorable public relations. Ability to maintain records, and prepare reports and correspondence related to the work. 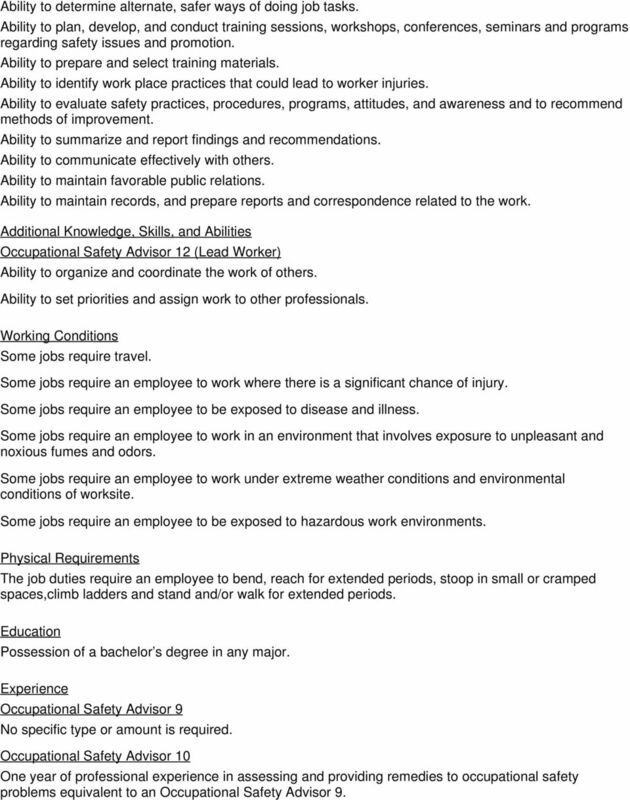 Additional Knowledge, Skills, and Abilities Occupational Safety Advisor 12 (Lead Worker) Ability to organize and coordinate the work of others. Ability to set priorities and assign work to other professionals. Working Conditions Some jobs require travel. Some jobs require an employee to work where there is a significant chance of injury. Some jobs require an employee to be exposed to disease and illness. Some jobs require an employee to work in an environment that involves exposure to unpleasant and noxious fumes and odors. Some jobs require an employee to work under extreme weather conditions and environmental conditions of worksite. Some jobs require an employee to be exposed to hazardous work environments. Physical Requirements The job duties require an employee to bend, reach for extended periods, stoop in small or cramped spaces,climb ladders and stand and/or walk for extended periods. Education Possession of a bachelor s degree in any major. 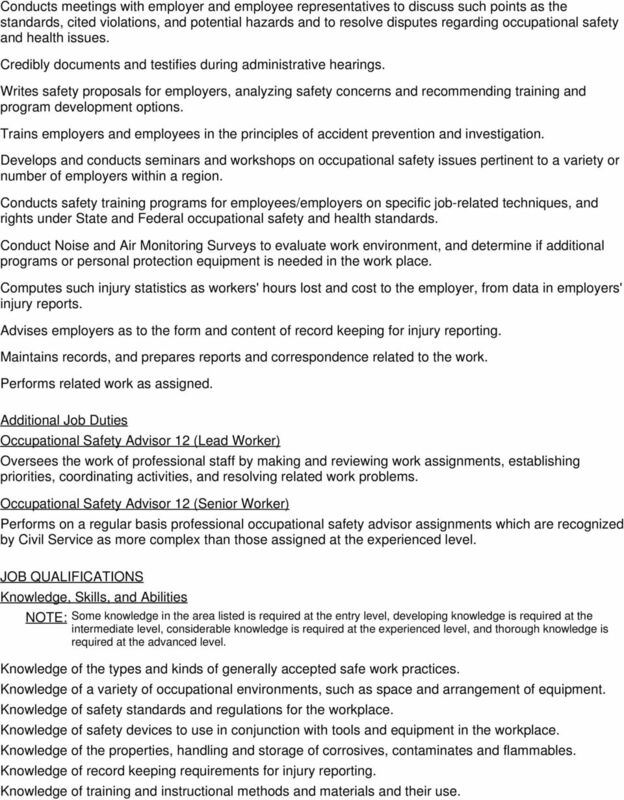 Experience Occupational Safety Advisor 9 No specific type or amount is required. Occupational Safety Advisor 10 One year of professional experience in assessing and providing remedies to occupational safety problems equivalent to an Occupational Safety Advisor 9. AVIATION SPECIALIST. Inspects aviation schools for conformance with state laws, rules, and regulations. PHYSICIAN. JOB DESCRIPTION Employees in this job function as professional physicians in a general or specialized area of medicine. Class specifications are intended to present a descriptive list of the range of duties performed by employees in the class. Specifications are not intended to reflect all duties performed within the job. POLICY MANUAL All rights reserved to CrewsInn Limited. No part of this document may be reproduced in any form or by any means, without permission in writing from the company CHAGUARAMAS TERMINALS LTD. Safe Work Australia Research agenda and activities November 2015 Today s Presentation Why does Safe Work Australia conduct research? What research has Safe Work Australia done, is doing and plans to do?